CherrySue, Doin' the Do: Rock of Ages - Guest Movie Review from Dave! Sherrie is a small town girl, living in a lonely world. She takes a midnight bus going anywhere.... If you read that line and started to hum or sing a certain song chances are you might like Rock of Ages! A song breaks out on the bus, this is Rock of Ages, the movie of the so I have been informed Hit Broadway Musical. Not even 2 minutes in and already two songs are either butchered or loved already depending on your viewpoint. Being from around that era and enjoying the songs the first time around I didn’t mind these ones. Considering what is played on the radio now, I don’t mind hearing the songs I grew up with. Sherrie falls in love with Drew who works at the Bourbon room having got mugged. Drew dreams of being a singer as does Sherrie. The Bourbon room is run by Alec Baldwin who is followed around by Russell Brand. But the Bourbon Room is not making money and Stacee Jaxx ( Tom Cruise ) is supposed to play his last night with his band before he goes solo. 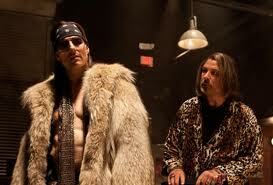 Tom Cruise playing nearly as good a character as when he played Les Grossman in Tropic Thunder steals the show. Playing the lead singer of a band who has his own demons and own demands he carries the movie along, which given this reviewers dislike of TC is no mean feat. But he carries it off and I only hope it is he singing those songs and not some singer with him lipsyncing. Drew dreams of being a rock singer but things get rocky between him and Sherrie while he is supporting Arsenal * the band Tom Cruise sings in, and the rest of the film is about them going about their days until they might meet up again. There is not too much about Catherine Zeta Jones I felt in this movie, its kinda hinted on why she is doing what she is doing but its not dwelt too long on. Russell Brand has a Birmingham accent and he lets it slip a lot, so he is at times speaking with a thick Ozzy Osbourne accent before he went to the states, or the normal Russell Brand accent we already know.Bryan Cranston as mayor doesn’t have that much on screen airtime but given the character its not really important. Malin Ackerman and Paul Giamatti do and they both play roles they may have played similar in other movies. Mary J. Blige also stars as someone who helps Sherrie out, but I felt there was little about her character in the storyline too. I have heard that there was a lot of story changes for the movie and having not been to see the broadway show, I found it samey, saying that its still an enjoyable movie. I enjoyed Cruise singing 'Pour Some Sugar On Me', Alec Baldwin singing 'I Cant Fight This Feeling' and be sure to keep an eye out for the blink and you will miss them cameos. I give it 3. 5 stars out of 5. Cheers for that, Dave, I'm raging to have missed the screening but think I'll catch a showing this weekend instead following that review. If only for the 90's hits! to to thank you for your time for this particularly wonderful read! I think the admin of this site is actually working hard in favor of his web page, because here every stuff is quality based data. Please reply back as I'm looking to create my very own blog and would like to find out where you got this from or just what the theme is called. Thank you! Hi there very cool site!! Man .. Beautiful .. Superb . Woah this weblog iѕ gгеat і like studying yοur articles.